Women seen weaving via the traditional practise of loinloom at the International Loinloom Festival at the Weaver’s Place in Diezephe on December 6. Dimapur, Dec. 6: The international loinloom festival organised by Exotic Echo at the Weaver’s Place at Diezephe Handicraft Village in Dimapur on Thursday brought to life the history of weaving in Naga society. The festival, based on the theme, ‘Protection of indigenous tribal rights on textiles and handicrafts’ commenced today. A senior officer from the department of Science and Technology, Dr. Zavei Hiese emphasised on the need to protect ‘our patent and not popularise’ as he opined that it was important to protect our age-old traditional weave as the advanced technology has made it easy for people to copy the original. “Our folklores and tradition are written in our attires and it is the women who are the keepers of these legends,” Trumy asserted as she expressed that there was potential for Naga texture. A sustainable business system for weavers needs to be developed; and there is a need for support from all stakeholders involved in the growth of craft-persons, buyers and the consumers, she said. Representing the Naga Council Dimapur and Sumi Council Dimapur, Hekavi Achumi was critical of the decline of traditional weaves while observing that Naga people wear traditional weaves without understanding the significance while there were copious replicas of the original designs at a lower cost making it impossible to indentify the original from the duplicate. “The genesis of weaving and the designs are through folk tales which many may argue, while many of the elders do not share traditional stories,” pointed out Achumi. Seno from North East Network from Chizami in Phek district expressed that any kind of textiles cannot sit idle as she argued that the beauty of loinloom is that every hand was unique; and we should not compromise and “break our heads” through patenting concern but push the beauty of loinloom. “Our weaves gives us a bonding which is a part of our culture and identifies every community. It is not only a source of income but social empowerment. 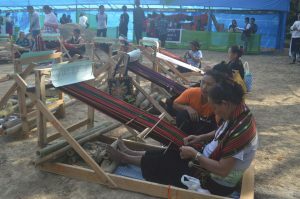 We have to allow the autonomy to weave and protection should not take away the rights of the weavers,” Seno argued.